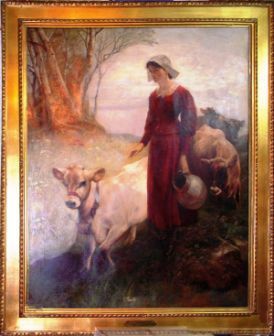 A historically significant painting of the Acadian heroine Evangeline entitled "Evangeline - Milking Time" was donated to the museum by Joseph M. Kochansky who recently acquired it from the estate of his late father Dr. Joe Kochansky of Lafayette, La. It was painted in 1870 by Scottish artist Edwin Douglas as part of his Shepherding Series which was first displayed in 1877 at the Royal Academy in London and again that year at the Imperial Jubilee Exhibition in Liverpool. In 1907, the image became an icon in Cajun culture when it was used in the book Acadian Reminiscences by Judge Felix Voorhies of St. Martinville. Then, in 1974, after Dr. Kochansky acquired the work from Louisiana artist George Rodrigue, famed for his Blue Dog paintings who was recently given an honorary doctorate degree from the University of Louisiana at Lafayette, the large oil on canvas was again exhibited, this time at the Art Center for the University of Southwestern Louisiana, now University of Louisiana at Lafayette. 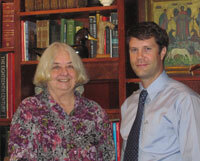 Shown in the photograph are (L to R): Kathy Kochansky and Andrew Perrin, member of the museum’s Executive Committee.